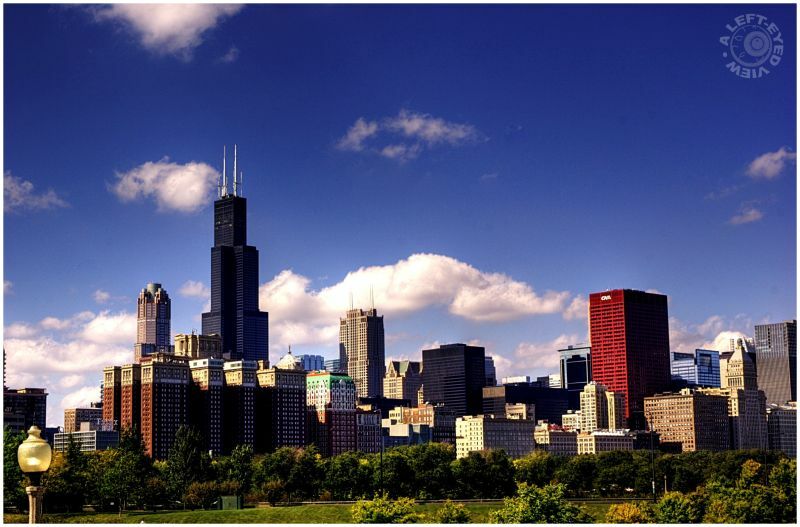 Steven (Chicagoland, United States) on 3 November 2009 in Cityscape & Urban and Portfolio. The first of three plates captured, before stitching all three together into a panoramic skyline, which is the fourth plate. I walked down to the Adler Planetarium (which extends east into Lake Michigan) to get some shots of the planetarium and when I turned around, I was quite astounded! The entire Chicago skyline was staring me right in my face. And what better day filled with blue skies and sunshine. Even after getting a few rounds of photos taken by hand, I felt I needed the extra "security" of having some of these shots captured with the help of a tripod....JUST IN CASE. And to be honest, when I looked at the photos on my computer, I wasn't sure which photos were taken with and without the tripod. Which I guess could be a good thing. Right? Trying to identify the buildings here, left to right include the 311 South Wacker Building, Sears (Willis) Tower, AT & T Corporate Center, Kluczynski Federal Building, and the CNA Center (red building). The low-rise building in front of/below Sears Tower is the Chicago Hilton Hotel. UPDATE: I stand corrected. All four plates this week were captured from the Museum Campus. Next week's panoramic shot is from the Adler Planetarium. Photo taken on September 27, 2009.
jolis, ces immeubles. Bien vu. Superb shot.. lovely light and composition. That is a magnificent skyline. Amazing definition and crispness to this image. Very engaging image. This is a lovely shot. The detail is so crisp and nice. Great work! Nice shot, I love the sky. Great kick-off to the series - a skyline like this just cries out for that pano you got coming. Beautiful colors and great details. I miss Chicago! great city, great cityscape & skyline! Yes, it's better than yesterday's! Another incredible skyline; great colors, lines, shading. What a sky, too! It rocks! wonderful city view with good rich colours - the building look superb against the deep blue sky - nicely taken! I'm with Earnest - I like it better than yesterday, mostly beacuse I've seen so many shots of the skyline with the water in the foreground (not to mention my own). It's nice to see Grant Park instead. a lovely skyline with beautiful rich color -- love those fluffy white clouds! That is an amazing view from the Planetarium ,but have never have had the luck to have seen it on such a beautiful day as this ! Great Shot ! !